Updated at 5:53 p.m. 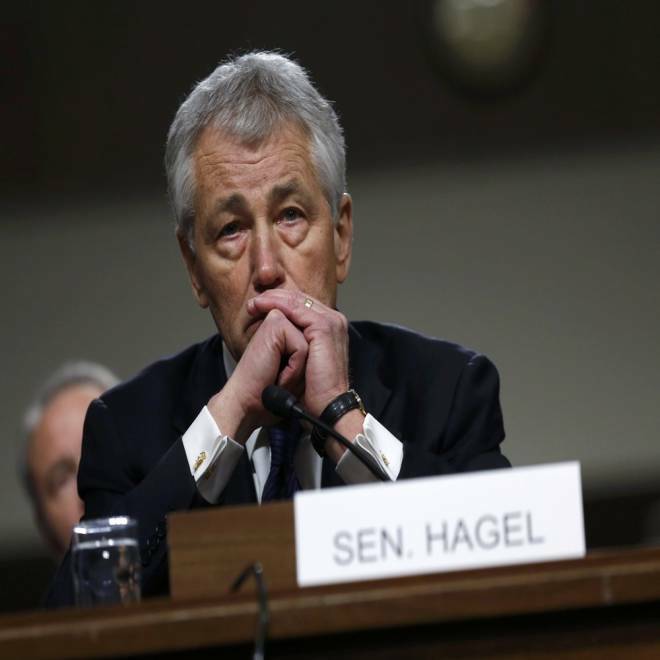 ET – Former Sen. Chuck Hagel, President Barack Obama’s choice to be secretary of defense, finished a day-long marathon confirmation hearing before the Senate Armed Services Committee Thursday, enduring nearly eight hours of testy and skeptical questions from Republicans. At the start of Thursday’s hearing, it seemed nearly certain that the Senate would vote to confirm Hagel. But the nominee labored at certain points during the day to clarify and explain his comments. Whether his occasional stumbles were serious enough to jeopardize his confirmation was not clear by the end of the testimony. There are 55 senators in the Democratic caucus and 45 Senate Republicans, so if there’s no filibuster, Hagel would seem assured of confirmation. The last time the Senate rejected a Cabinet nominee was in 1989 when there was a Republican president and a Democratic-controlled Senate. Republican senators confronted Hagel with quotations from statements he had made months or years ago – and sometimes he apologized for them or amended them. Late in the day Sen. Mike Lee, R- Utah, asked Hagel whether he’d said in 2003 that Israel keeps Palestinians “caged up like animals” and whether he still believes that. Sen. John McCain, R-Ariz., grills Secretary of Defense nominee Sen. Chuck Hagel, R-Neb., on his opposition to the 2007 troop surge in Iraq. This prompted Armed Services Committee chairman Sen. Carl Levin, D- Mich., to intervene, “Just to make sure your correction is clear, we do have a position on containment – which is we do not favor containment.” Hagel quickly concurred with Levin’s statement. “I should have used ‘influence,’” he said. Later, Sen. Lindsey Graham, R- S.C., challenged Hagel to “name one dumb thing we’ve been goaded into doing” by the pro-Israel lobby or to identify one member of Congress whom the pro-Israel lobby had intimidated. Hagel said, “I didn't have in mind a single person," and did not identify any policy the U.S. government had been goaded into. NBC's Kelly O'Donnell reports on the latest from Chuck Hagel's confirmation hearing. Early in the testimony, the Iraq war and President George W. Bush’s 2007 surge of U.S. troops into Iraq became the heated focus of the hearing. When McCain shot back that Hagel had been wrong about the surge, Hagel said his “most dangerous blunder” comment had been “not just about the 2007 surge but the overall war of choice going into Iraq” in 2003. As a senator, Hagel voted for the congressional resolution authorizing Bush to invade Iraq, but later turned critical of Bush’s conduct of the operation. Other Republicans on the committee repeatedly pressed Hagel on his support for endorsement of Global Zero, the movement calling for abolition of nuclear weapons by 2030. Hagel served on the Global Zero U.S. Nuclear Policy Commission which issued a report last May calling for an 80 percent reduction in the U.S. nuclear arsenal. Former Senator Chuck Hagel, R-Neb., testifies during a Senate Armed Services Committee hearing on his nomination to be Defense Secretary, on Capitol Hill, Jan. 31, 2013. And he said the Global Zero report was discussing “illustrative possibilities” and “scenarios” and wasn’t urging specific policies. In his opening statement Hagel pledged that he would maintain an effective nuclear arsenal. “America's nuclear deterrent over the last 65 years has played a central role in ensuring global security and the avoidance of a World War III. I am committed to modernizing our nuclear arsenal,” he said. Hagel, who was seriously wounded while serving as an Army infantryman in Vietnam, was a Republican senator from Nebraska from 1997 to 2009 but did not support Republican presidential candidates McCain in 2008 or Mitt Romney last year.